UD researchers found that staggering, instead of aligning, rows of wind turbines in the Lillgrund Wind Farm would have improved performance. Research into the best ways to arrange wind turbines has produced staggering results quite literally. 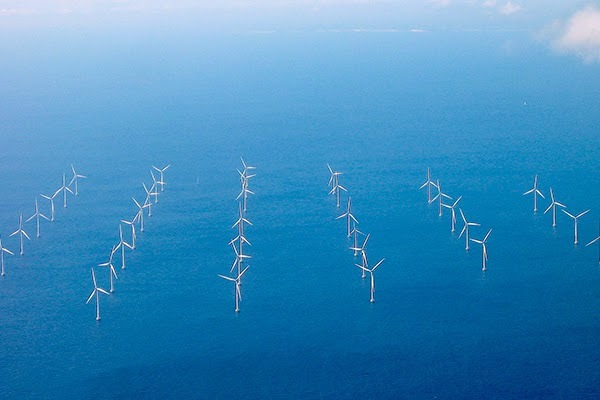 The University of Delaware's Cristina Archer and her Atmosphere and Energy Research Group found that staggering and spacing out turbines in an offshore wind farm can improve performance by as much as 33 percent. "Staggering every other row was amazingly efficient," said Archer, associate professor of physical ocean science and engineering and geography in UD's College of Earth, Ocean, and Environment. The findings, which appeared last month in Geophysical Research Letters, could help engineers plan improved offshore wind farms. The researchers used an existing offshore wind farm near Sweden as the basis for their study, comparing the existing tightly packed, grid-like layout to six alternative configurations. In some, they kept the turbines in neat rows but spaced them farther apart. In others, they shifted the alignment of every other row, similar to how rows of theatre seats are staggered to improve the views of people further back. In computer-intensive simulations that each took weeks to run, the team took into account the eddies, or swirls of choppy air, that wind turbines create downwind as their blades spin and how that air movement would impact surrounding turbines. They found that the most efficient arrangement was a combination of two approaches. By both spacing the turbines farther apart and staggering the rows, the improved layout would decrease losses caused by eddies and improve overall performance by a third. The optimal configuration had the rows oriented to face the prevailing wind direction, for example from the southwest in the summer along the U.S. East Coast. Most locations, however, have more than one dominant direction from where wind blows throughout the year. The optimal configuration for a season may not be optimal in another season, when the prevailing wind changes direction and intensity. Considering these various factors could better inform where and how to configure future offshore wind farms, Archer explained. "We want to explore all these trade-offs systematically, one by one," she said. The study is part of Archer's overall research focus on wind and applications for renewable energy production. Trained in both meteorology and engineering, she uses weather data and complex calculations to estimate the potential for wind as a power source. Last year, Archer and colleague Mark Jacobson of Stanford University found that wind turbines could power half the world's future energy demands with minimal environmental impact. In a follow-up to that study, Archer and Jacobson examined how worldwide wind energy potential varies seasonally. They found that in most regions where wind farms could feasibly be built on land and offshore, capacity is greatest from December to February. However, even factoring in seasonal variability, the researchers found there is enough wind to cover regional electricity demand. Those results were recently published in Applied Geography and share detailed maps and tables that summarize the distribution of wind throughout the world by season. "I'm hoping these will be tools for giving a general overview of wind at the global scale," Archer said.